Alright, I am back with the next best 2 games in my eyes in the past 4 seasons. 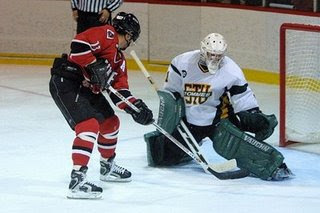 Looking forward to Wednesday's matchup with the Aigles Bleus! The new recruits I had alluded to earlier came through in a huge way in the playoffs.....not to mention the amazing play of Matt Davis througout the year, especially in this game. 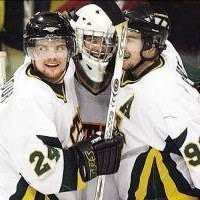 People thought there was a huge hole in net with Aaron Molnar gone and the way Matt had played to replace him after Molsy went down 10 minutes into the playoffs the year before against St. Marys. This was also a game where it could have been Matt Seymour's final game as a Tommie. That night was not the night. He produced 3 points, 2 goals in the first period. All 3 Christmas recruits got points and Matt Davis picked up the shutout in probably his greatest game in the "game 7" atmosphere at the LBR. The celebration was on and everyone was estatic exercising some elimination games at home since STU was 0-2 in 2 years in games where they had a chance to eliminate a team from the AUS playoffs. 2 things are hard to believe in this game. Well, actually 4. We played at the York Arena on the Northside due to the LBR being renovated. We went undefeated at the rink at the start of the season going 3-0. 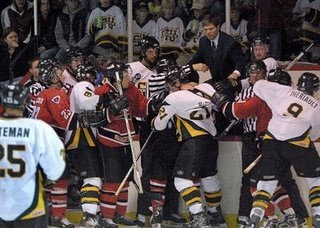 UNB won the national championship out of the blue essentially. And this was the last game we beat them in exhibition, regular season and playoffs. This was my Dad's first Tommies game ever to watch and it was against the hated Squirrels. STU got into penalty trouble early and Nick Marach scored on the 5 on 3. Then it was all STU the rest of the way. Jeff Bateman scored a pretty shorthanded goal with David Bowman pretty much tackling him from the blueline in. Then Matt Seymour scored and the Tommies never looked back. The highlights from this game were Bateman's goal and the huge line scrum in front of the Tommies bench (and if anyone wants to see some quality pictures from my photo editor father, they are on my facebook, or wants me to send some, feel free) and Aaron Molnar stoning Rob Hennigar on a penalty shot. The fans enjoyed the great hockey game. #2 and my honourable mention list will be up tomorrow sometime, possibly the top 10 players in the past 4 seasons, we will have to see.